Hot water - to dip the pouch. 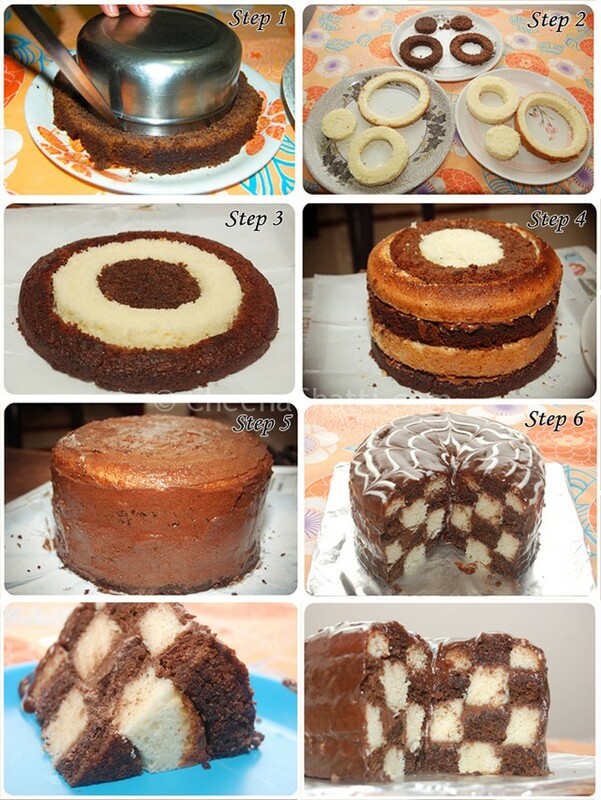 Let me share another cake recipe with you – Checkerboard cakes. Its little lengthy to prepare. You need to have some patience for this. But at the end its worth the effort. Hope you all will let me know your feedbacks after trying this. Sieve flour with baking powder thrice. In a large bowl, add powdered sugar and oil and beat until its pale and creamy. Add one egg at a time an beat well. Mix in all the eggs until well incorporated. Add flour-baking powder mix spoon by spoon to egg-sugar mix and fold gently without lumps. Pour the batter into a prepared cake tin. Bake it for 20-25 minutes or until the cake passes a skewer test. Start checking cake in 18-20 minutes. When its done, remove the cake tin to a wire rack and let it cool. Mix flour with cocoa powder and baking powder. Sieve thrice. Add flour-cocoa-baking powder mix spoon by spoon to egg-sugar mix and fold gently without lumps. In a glass bowl, beat butter until fluffy. Add in powdered sugar and beat. Mix cocoa powder in milk and mix without lumps.Add this mix to butter-sugar mix. Mix well in one direction and add fresh cream. Fold to a creamy structure. Keep refrigerated for some time. When both the cakes are cool, lets assemble it. Cut off the crown of the cake (If its bulged upside). Cut both the cakes horizontally in almost the same size. Carefully keep large mold on the middle of the cake and using a knife cut a round piece. Then use the small mold to cut off the small round portion. Retain the 3 round portion in another plate. Using the same method, cut chocolate cake too. Totally you have 12 round pieces of cakes! Now, lets see how to assemble it. Use a cake board or a big plate to assemble it. Tear off 4 pieces of butter paper the keep on four sides of the cake. At first, place a chocolate side round piece on the middle. Then keep a vanilla piece to fix inside the chocolate round. Then a small chocolate round in the middle. Apply a very thin layer of butter cream frosting on the top of it, to stick the other layer. Next, keep a vanilla side round piece, then a chocolate middle piece and then a vanilla small piece inside and give a gentle press to stick each other. Likewise finish arranging cakes alternate colors. Apply a thin crump coat of chocolate frosting on the sides too, to cover all the portions. Keep refrigerated for 15 minutes. Now its the time to prepare ganache. In a sauce pan, bring to boil fresh cream, when it starts boiling, switch off the stove and add grated chocolate to it and mix thoroughly until its fully melted. Take out the cake from the fridge and pour the hot ganache over the cake to get it covered fully. Grate white chocolate and put in the side corner of zip lock pouch. Dip the chocolate filled portion of the pouch in hot water, so that the chocolate gets melted. Take out from hot water n check its melted fully. Wipe the pouch with a neat cloth. Cut the tip of the corner of the pouch to get a very small hole to pipe. Then draw circles smaller to bigger one by one on the top of the cake. Using a tooth pick hold on the center of the chocolate circle and drag to the end. Refer to the below video to learn how to decorate with chocolate ganache and to draw a web. Likewise draw a web and gently pull off the butter paper that we fixed beneath the cake. 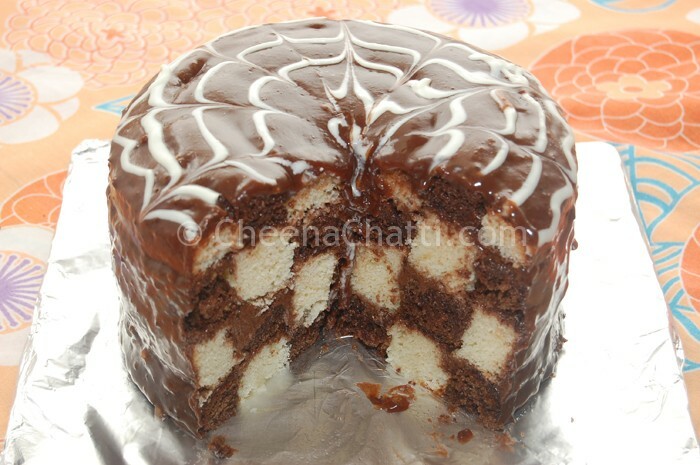 Cut the cake and see how beautifully you have made a checker board cake.. Here is a small video tutorial I quickly prepared for checkerboard cake preparation in Malayalam. You can find the english version below. This entry was added on August 13th, 2013 by Athira Sooraj in Bakery and tagged with cake, checkerboard cakes, cake recipes, checkerboard cookies, easy cake recipe, best checkerboard cake recipes, how to make a checkerboard cake, checkerboard cake recipe. Last revised on March 27th, 2018. 5 out of 5. Thanks a lot for this beautiful recipe athira. Was always wondering how to prepare this cake.